Also serving communities of Fredonia. There are 44 Assisted Living Facilities in the Hermitage area, with 3 in Hermitage and 41 nearby. The average cost of assisted living in Hermitage is $4,200 per month. This is higher than the national median of $3,346. To help you with your search, browse the 116 reviews below for assisted living facilities in Hermitage. On average, consumers rate assisted living in Hermitage 4.4 out of 5 stars. Better rated regions include Youngstown with an average rating of 4.4 out of 5 stars. Caring.com has helped thousands of families find high-quality senior care. To speak with one of our Family Advisors about assisted living options and costs in Hermitage, call (855) 863-8283. Located about halfway between Pittsburgh, Pennsylvania and Cleveland, Ohio, Hermitage is the third largest city in Pennsylvania in terms of land area. As of the 2016 census, 29.5 percent of the city's population was age 62 or older. To help accommodate this large senior population, there are 43 assisted living facilities in the Hermitage area, with three of them within the city itself. The State of Pennsylvania recognizes three distinct types of assisted living facilities. 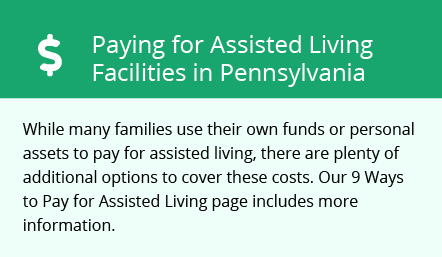 The largest of these are assisted living residences, which are licensed by the Pennsylvania Department of Aging, Office of Long-Term Living, Division of Licensing. These facilities are allowed to be dual licensed and offer nursing care along with eating, bathing and dressing assistance. There are also public care homes, which are licensed by the Department of Public Welfare, Adult Residential Licensing. These facilities are not allowed to offer any type of nursing or medical care. Lastly, the area offers adult foster care homes, which are administered by Area Agencies on Aging and restricted to three or less residents. The cost of living in Hermitage is 17 percent lower than the national average and 14 percent lower than the state norm. Grocery prices alone make the area very attractive to budget-conscious seniors. The property crime rate in Hermitage is slightly above the national average. However, with a relatively low violent crime rate, it is more than twice as safe as the national average. For seniors who enjoy getting out, this is very good news. For seniors who enjoy being outdoors, Hermitage winters could be challenging. Temperatures in the teens are very common and the city averages 51 inches of snow each year. With an air quality rating of 71 from the EPA, Hermitage is an ideal local for seniors with sensitive respiratory systems. The national average is 58, 13 points lower than the score received by Hermitage. The Hermitage area is home to world-class medical facilities, including Sharon Regional Health System, in the event of medical emergencies or illness. Hermitage offers seniors several public transport options, including the Shenango Valley Shuttle Service, which runs regular routes between major shopping areas, and Mercer County Community Transit, which provides door-to-door services by appointment. Both systems offer discounted fares to seniors over the age of 60. Assisted Living costs in Hermitage start around $4,200 per month on average, while the nationwide average cost of assisted living is $4,000 per month, according to the latest figures from Genworth’s Cost of Care Survey. It’s important to note that assisted living rates in Hermitage and the surrounding suburbs can vary widely based on factors such as location, the level of care needed, apartment size and the types of amenities offered at each community. Financial aid is available to Hermitage assisted living facility residents in the form of the CHC and PDA 60+ waiver programs. Neither program directly pays for room and board, but each provides supplemental income to offset the cost of assisted living facilities. Hermitage and the surrounding area are home to numerous government agencies and non-profit organizations offering help for seniors searching for or currently residing in an assisted living community. These organizations can also provide assistance in a number of other eldercare services such as geriatric care management, elder law advice, estate planning, finding home care and health and wellness programs. To see a list of free assisted living resources in Hermitage, please visit our Assisted Living in Pennsylvania page. Hermitage-area assisted living communities must adhere to the comprehensive set of state laws and regulations that all assisted living communities in Pennsylvania are required to follow. Visit our Assisted Living in Pennsylvania page for more information about these laws.